Hot on the tracks of the next Radeon GPU lineup, AMD unveiled a set of new features exclusive to the line up; most interesting of which was the AMD ATi Eyefinity Vision Display, which can power up to six Ultra HD monitors from a single graphics card. The new feature which would probably land on the new top end Radeon 5800 series is capable of bringing Eye Definition graphics with a resolution of 268 mega pixels, close to the number of pixels the human eye can resolve. 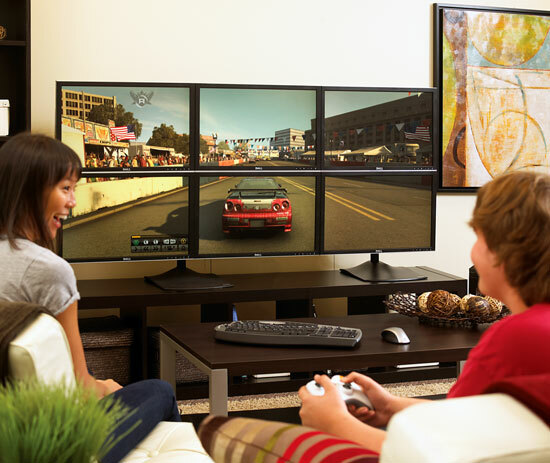 What’s more is that you can stack up the monitors for media playback and gaming. You probably wont get very high frame rates, but still, you would get near life like graphics. Game developers across the globe are working to add Eyefinity support for current a future titles. Not impressed yet? well how about multiplying all that power by 4? Yes that’s right. You can power up to 24 monitors by using CrossFire X4 but I wouldn’t be playing Crysis on that resolution because I would probably get 1 or 2 frames per second. To make things a bit more interesting, a number of game demos were shown running the technology, including CryEngine 3 by Crytek. AMD is working with Samsung to get a new line of ultra thin bezel monitors in the market to make the experience as seamless as possible. If this doesn’t compel anyone to buy the 5800 GPUs, I don’t know what will.